The Zura Hall renovation involved upgrading the electrical service and distribution equipment from an existing 4.16kV to a new 12kV distribution system. All new HVAC systems, fire alarm and life safety, updated seismic performance, and lighting were included in the scope of work. Dynalectric completed an interior renovation to an existing concrete tower. This project was awarded LEED Silver certification. Sustainability features included occupancy sensors, LED lighting, and the monitoring of energy use. This project also was recognized with a merit award from the Design-Build Institute of America for the 2016 Design-Build Project Team Awards. 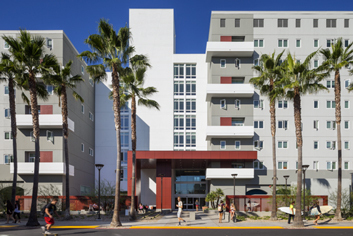 Zura Hall was first opened to SDSU Students in 1968 originally being 140,900 gross square-feet. The building has since served as a student residence hall and after years of accrued maintenance, has been completely renovated to keep up with today’s needs for innovative campus living. The renovated dorm includes 310 student rooms, lounges and study rooms, restrooms, offices, storage, and faculty housing. It officially reopened its doors in August of 2015. Dynalectric was invited to be part of Balfour Beatty’s team based on previous project experience and design-build/preconstruction value.